I have to admit, the scene from The Empire Strikes Back (1980) depicted in these three trading cards has always fascinated me. You remember the set-up, right? On Cloud City, Lando leads fugitives Han Solo, Princess Leia, C3PO and Chewbacca to dinner. However, as they walk to the dining room, he reveals that he's made a deal with the Empire that will protect his interests on Bespin forever. A door opens, and Darth Vader is revealed at the end of a very long (and fully set) dining room table. 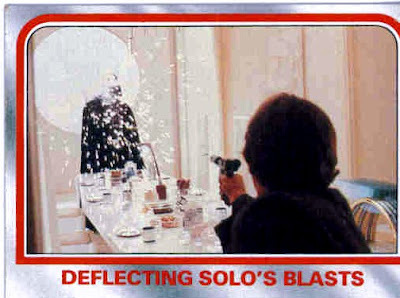 A shocked but fast Han draws his blaster and fires, Lord Vader deflects the shots, and then invites everyone to join him for a meal. Then the door closes. End of scene. But...didn't you ever wonder what the meal was like? I mean, what did the rebels talk about while breaking bread with Darth Vader? 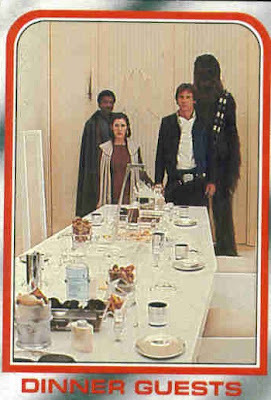 I can't imagine Chewbacca is much for dinner conversation (or table manners, for that matter). 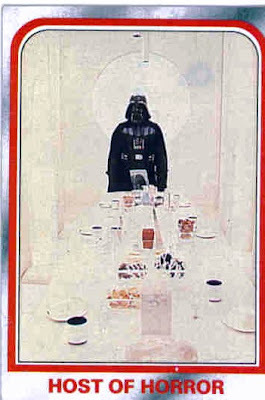 Also, isn't it awkward eating a meal when your "host" (Lord Vader) can't uh...well, can't eat? I mean, that mask pretty much precludes eating, unless he opens a panel on his helmet and sips his food through a straw. And where do you go in terms of courteous dinner talk after the guest has attempted to shoot the host? Appetizers? And also, in terms of continuity, Vader is back with Leia a second time (the first time was on the Death Star in Star Wars) and he still doesn't sense that she is a daughter of Skywalker, or, at the very least, "strong" with the force. I'm only half-joking. I really would have loved to see what this scene could have been; with Leia and Vader (and Solo) at the same table together forced to face one another. Seriously: what would they have talked about? Would or could this have been an opportunity in the saga to discuss respective philosophies (the way Anakin and Amidala did in Attack of the Clones?) Democracy/Tyranny? Or would it have just been too silly? I mean, can you imagine Lord Vader, in that deep voice, asking Han Solo to pass the salad dressing? You tell me: what do you think the dinner conversation was about that night? Dude, This scene has always interested me too. Not only did you have Vader at the table, but also my favorite character, Boba Fett. Did Boba and Vader discuss the old days of the Clone Wars amongst themselves? Did Boba and Han talk about their experiences working for Jabba? Did Vader tell Leia that she looked a lot like his deceased wife? Not to mention, it looks as if Lando stayed for dinner too. Talk about an awkward dining situation! I would imagine a brawl of some sort broke out during the meal and that's what lead to Han's torture. This scene opens up so much to the imagination. By the way, when the new TV shows starts, I want a whole episode about the protocol droid that tells 3PO to "i-chu-ta!"